"Chubu" redirects here. For airport near Nagoya, see Chūbu Centrair International Airport. Mount Fuji is the Chūbu region's most famous landmark. The Chūbu region (中部地方, Chūbu-chihō), Central region, or Central Japan (中部日本) is a region in the middle of Honshū, Japan's main island. Chūbu has a population of 21,715,822 as of 2010. It encompasses nine prefectures (ken): Aichi, Fukui, Gifu, Ishikawa, Nagano, Niigata, Shizuoka, Toyama, and Yamanashi. It is located directly between the Kantō region and the Kansai region and includes the major city of Nagoya as well as Pacific Ocean and Sea of Japan coastlines, extensive mountain resorts, and Mount Fuji. The Chūbu region covers a large and geographically diverse area of Honshū which leads to it generally being divided into three distinct subregions: Tōkai, Kōshin'etsu, and Hokuriku. There is also another subregion occasionally referred to in business circles called Chūkyō. The Tōkai region, mostly bordering the Pacific Ocean, is a narrow corridor interrupted in places by mountains that descend into the sea. Since the Tokugawa period (1600–1867), this corridor has been critical in linking Tokyo, Kyoto, and Osaka. One of old Japan's most important ancient roadways, the Tōkaidō, ran through it connecting Tokyo (at that time called Edo) and Kyoto, the old imperial capital. In the twentieth century, it became the route for new super-express highways and high-speed railroad lines (shinkansen). The area consists of Aichi, Mie, Shizuoka,and southern Gifu prefectures. The three Tōkai prefectures centered on Nagoya (Aichi, Gifu, and Mie) have particularly strong economic ties, and the parts of these prefectures that are closest to the city comprise the Chūkyō Metropolitan Area. This area boasts the third strongest economy in Japan and this influence can sometimes extend into the more remote parts of these prefectures that are farther away from Nagoya. 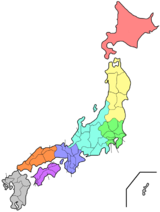 Thus, these three prefectures are sometimes called the "Chūkyō region" in a business sense. This name does not see widespread usage throughout Japan; however, as the economy in the area strengthens, this name may become more well-known country-wide. Kōshin'etsu is an area of complex and high rugged mountains—often called the "roof of Japan"—that include the Japanese Alps. The population is chiefly concentrated in six elevated basins connected by narrow valleys. It was long a main silk-producing area, although output declined after World War II. Much of the labor formerly required in silk production was absorbed by the district's diversified manufacturing industry, which included precision instruments, machinery, textiles, food processing, and other light manufacturing. Kōshin'etsu means Yamanashi, Nagano, and Niigata prefectures; Niigata is also included to the Hokuriku region. Yamanashi, Nagano and northern Gifu Prefecture are sometimes referred to as Chūō-kōchi or Tōsan region. The district has very heavy snowfall (sometimes enough to block major roads) and strong winds in winter, and its turbulent rivers are the source of abundant hydroelectric power. Niigata Prefecture is the site of domestic gas and oil production as well. Industrial development is extensive, especially in the cities in Niigata and Toyama; Fukui and Ishikawa prefectures also have large manufacturing industries. Historically, Hokuriku's development is owed to markets in the Kansai region, however recently the urban areas at the heart of the Kantō region and Tōkai region are having a heavy an influence as well. Hokuriku has port facilities which are mainly to facilitate trade with Russia, Korea and China. Transportation between Niigata and Toyama used to be geographically limited and so Niigata has seen especially strong influence from the Kantō region, because of this Niigata Prefecture is often classified as being part of the Kōshin'etsu region with Nagano and Yamanashi Prefectures. ^ a b Ministry of Internal Affairs and Communications Statistics Bureau (26 October 2011). "平成 22 年国勢調査の概要" (PDF). Retrieved 6 May 2012. Nussbaum, Louis-Frédéric (2002 ). Japan Encyclopedia. Trans. by Käthe Roth. Cambridge, Massachusetts: Harvard University Press. ISBN 0-674-01753-6, ISBN 978-0-674-01753-5. OCLC 58053128. This page was last edited on 28 March 2019, at 19:04 (UTC).